Why in the world would elementary school children want to stay after school? In the case of the seventy-five members of the “Green Team” at Wakefield Elementary school, it’s because they want to dig in the dirt. On Wednesday afternoons, kindergartners and first graders dig in “the park” (the school’s demonstration garden), and on Thursdays, second, third and fourth graders have their turn. Teacher Debra Ryan is aided by fellow teachers Melody Peters and Sandra Daniels, as well as by parent and grandparent volunteers and master gardener Suzanne Buchanan. They divide the children into small groups for the day’s activities, which rotate from task to task in the garden. The Green Team participates in weeding contests—the weed with the longest roots wins—and sometimes there are feeding frenzies, as occurred when students discovered that their broccoli plants, growing in barrels, had produced a bumper crop, or when they were allowed to sample leaves of the plants in their herb garden. Worms are popular, and finding a bunch—no, that can’t be right—oh, yes, a knot or bryce of worms in the compost piles brings great excitement, as does seeing that the tadpoles in the pond have become frogs. The pond was constructed during the 2002-2003 school year by Austin Fluke and Henry Petrash as their Eagle Scout project. Then there is planting time. 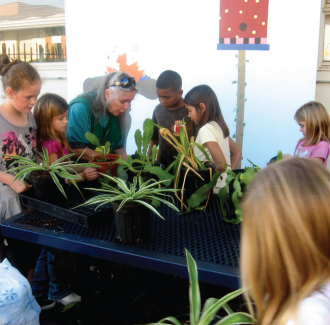 Last September the Grayson County Master Gardeners donated plants left over from their plant sale to the Green Team. Students learned about the different types of plants and their growing requirements. Does a specific plant need full sun or shade, moist growing conditions or dry? Then they planted their chosen plants in appropriate spots. The students have become quite attached to the plants, and they race to check on them each week when they enter the park. The treat of the semester is a field trip to the Arboretum in Dallas, which is funded by a grant from the Sherman Educational Foundation. There the students recognize plants like those that they have nurtured at Wakefield and see many others that they have never seen before. They see what life was like for pioneer gardeners and even get to use antique tools. When portable buildings were removed from the Wakefield campus this year, the area they had occupied became available for future use by the Green Team. The hope is that after the land is tilled and a fence and walkways are put in by volunteers, it will become an enormous Green Team vegetable garden. Anyone interested in starting a gardening club at their elementary school is encouraged to contact the Grayson County Master Gardener office at (903) 813-4206. Over four generations, the Nuckols clan moved west from Virginia to new farms. But all that changed when Virgil Nuckols was transformed from a farmer to the Texas Kidd. Martha Hovers has been operating Arfhouse in Sadler for twenty years, ever since she transformed her grandfather’s farm into a “no-kill” animal shelter. “No-kill” means just that. No dogs are ever put down at the shelter. At last count, the facility has 314 dogs that patrol the property and greet newcomers to the gate with an array of barks, howls and wagging tails.